I just completed my weekend interview with Eric King over at King World News for the Metals Wrap. 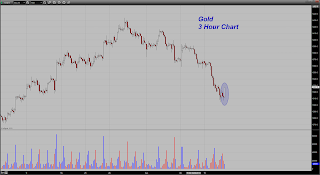 We were discussing the very late in the session price action in gold and talking about the impact of the news story that he broke with Andrew Maguire about the whistleblowers from Morgan and the gold price manipulation scheme. I remarked at how unexpected the late-in-the-day rally was to me and was wondering what might have caused the surge in volume late on a Friday to produce it. It certainly appears that as the story made the rounds, a lot of interest was generated in buying both from fresh longs now looking for a bottom as a result and some nervous bears who were unsure how the market would react to it. We now await the open of trade in Asia Sunday evening to see how traders over there will react to the story and whether or not gold can at least clear the $1330 level to signal whether or not another short term bottom is in the market. I am putting up a THREE HOUR CHART, to show you the spike upward during the last three hours of trading. I also noticed that for a Friday afternoon, the volume was unusually high. Normally, we see hardly any volume whatsoever that time of the day on a Friday as most traders are long gone for the weekend. God said only Gold and Silver are Money. Do you not feel stupid accepting a $ 100.00 Federal Reserve Note that cost only 4 cents to print and is backed by nothing as real money ? God told us and we ignore him and accept the worthless notes anyway so we deserve what we get. We are in for real bad times and i mean real bad. The Destroyer Star or Planet X and Wormwood will be here very soon so get prepared. God i am saying that I am sorry for the millionth time . your servant. Virtually all gold and silver companies will continue to stay quiet about the rigging. Pierre Lassonde and others in gold community will continue to talk around this. The bullion banks still control the market. They initiate a move one way or the other and the sheep (specs) do their dirty work for them. I don't really see this 'new' news as doing anything. The bears couldn't push it below 1310, now less 1300. Silver has been strong all along - other than the 8% selloff day courtesy of the criminals. I took it as an opportunity to buy more physical. I saw the metals/miners move up at the close and thought it was the likely possibility that Summers would get fed post. A Zero Hedge article, at about that time, made it sound like he might be crazier than the Bernank. Isn’t this a huge backwardation? oh my god, in just 3 hours i can't believe at all and when the price came down, all woman will be running to the jewel shop. April, May, June now September Gold, Silver and Co doing the hard yards taking it on the chin is this deflation for real or engineered, I am kind of leaning to engineered because of the timing and nature of the moves and outside bonds not a lot else is deflating. Something has to crack soon most other assets are going to have to take the dive like Gold and Co [Depression] or Gold will snap back with a vengeance. Liquidity if truly drying up will have to flow to all asset classes and it ain't happening yet. The triggers are lining up ahead, should be an exciting couple of months. If Gold can get some traction here we will be looking at a higher low again and weeklies still positive for precious metals, most Gold stocks and Gold indexes. p.s. Any one for a class action TBTF could be blown away if recent stories can be supported! Grabbed some NUGT end of day Friday. 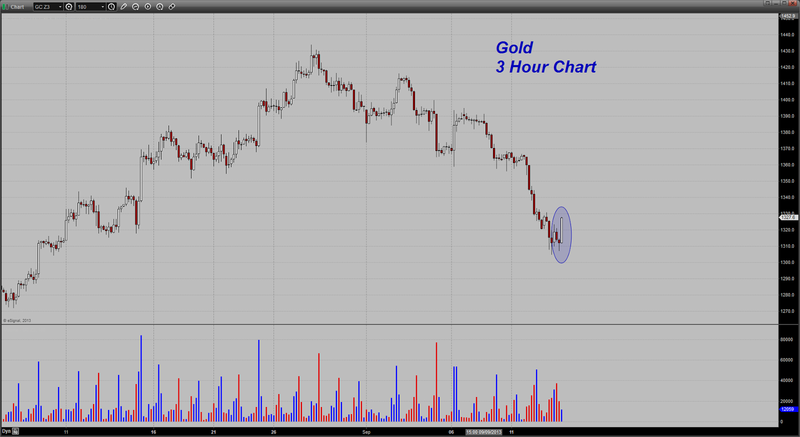 It was over $100 when gold was 1400 + a few weeks back and on Fri hit 52. Seems due for a bounce back. If gold continues to fall there is always NUGT's twin DUST. Either way $ can be made here. Hi Dan thanks for your blog....a realist can be a rarity in the gold world. Just wondering how much value you give to the fact that the bears couldn't keep it under the %50 fib retracement of the move from $1180 to $1434 and could that be the reason for the bounce ?